Cheerful colors and nostalgic details lend their charms to these kitchens inspired by the past. Read on to learn how to re-create the look in your own home. They don’t make ‘em like they used to. Today, the popular notion of a “dream kitchen” includes an an all-white color palette, a suite of stainless steel appliances, and granite countertops polished to a glimmering sheen. In years past, however, such a design would most likely have struck homeowners as cold, antiseptic, and uninviting. Indeed, kitchen design philosophy has changed a great deal over the decades. Some of us are old enough to remember, for example, that kitchens used to be colorful! From the flooring to the countertops and curtains, everything seemed to feature an eye-catching hue. Some traditions are best left in the past, of course, but if you’ve been yearning to cook in a space with more personality, in a room that recalls a bygone era, these tips can help you design the retro kitchen of your dreams. 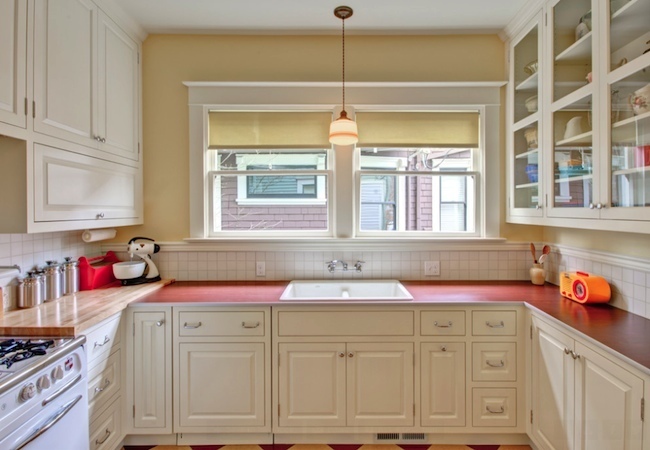 What’s the best color scheme for a retro kitchen? That depends. You can hark back to the 1950s by channeling the most popular colors of those long-ago days, bold turquoise and red. Or for a look that says “The Sixties,” choose mustard and avocado—colors that some are still trying to forget, not bring back. In the kitchen pictured, designers Kevin Fischer and Charlotte Cooney, of Alice Design/Domestic Arts, chose pale yellow and tomato-red, a combination that recalls the early 20th century; builders Hammer & Hand brought their vision to life. Since there are so many paint colors available today, a great way to narrow the field is to look at pictures of kitchens from the era you’re trying to re-create, and see what strikes your fancy.